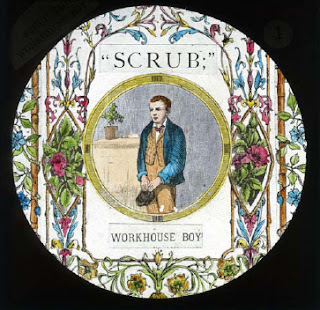 Scrub, Workhouse Boy is one of a rare series of hand-tinted magic lantern slide sets dating from 1880 to 1900 that have been made available online by the University of Bristol's Theatre Collection. The magic lantern was a precursor of the modern slide projector. Mervyn Heard provides a capsule history of this "prodigious conjuring device" here. Among the collection's 400 magic lantern slides are several complete sets, or stories, including Scrub; Rare Metal: A Story of City Life; The Life Boat; Nellie’s Prayer; The Matron’s Story; Christmas in Paradise; and Little Jim. Some magic lantern stories, like Christmas in Paradise, which was published by the Wesleyan Conference Office in London as part of a temperance series on the dangers of drink, were essentially sermons. 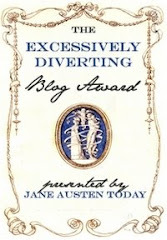 Others, like Scrub, were melodramatic tales of misfortune and redemption that mirrored popular taste in literature and drama. In addition to the story sets, Bristol's collection includes images of carvings, crosses, effigies, and stained glass in British, French, Italian, Swiss, and German churches that were once part of magic lantern shows on religious art and architecture. 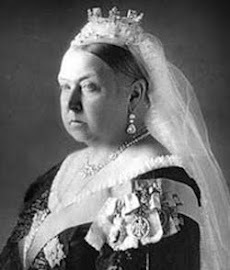 Today they form a unique visual resource for the historian. A separate set of slides, the T. Edgar Pemberton Lantern Slide Collection, shows unusual exterior and interior views (including backstage work areas) of the Theatre Royal, Birmingham. Many of these images were published in Pemberton's history of the theatre in 1901.